The University of Rhode Island English department will be hosting their annual Ocean State Writing Conference Thursday, Oct. 26 through Saturday, Oct. 28. 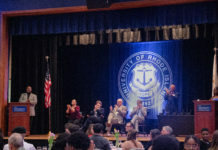 The three-day conference was traditionally held during the summer but has moved to mid-semester in the hopes of engaging more of the undergraduate student body that, without living locally, may not have the opportunity to attend in the summer months. “Our hope and aim is to bring the conference closer to our undergraduate and graduate populations so that they can benefit from the conference offerings and experience these writers’ presence on campus as integral to the training we are offering in both our Major and our new Creative Writing option,” said English professor Mary Cappello. As in years past, the conference will feature workshops, readings, craft sessions, presentations and panels that are designed to mentor writers in all stages of their work and inspire creativity. Additionally, the conference will continue to bring accomplished writers to campus for presentations, panels and instruction. These award-winning writers are in high demand, and the University is very fortunate to be able to work collaboratively with them. Lowenthal, who will be accompanied by writers such as Kenny Fries, Major Jackson and Masha Gessen — the conference’s keynote speaker — collectively span the genres of novels, memoirs, poetry and journalism. Masha Gessen, a journalist, bestselling author, translator and activist, will be delivering the conference’s keynote address Friday, Oct. 27 at 4 p.m. in Swan Hall Auditorium which will be followed by a book signing. This address is free and open to the public. Other notable workshops include a Master Class led by Gessen, a panel discussion on historical narratives, a crafting session on screenwriting, sessions for beginning through intermediate poetry and fiction as well as feature readings from the acclaimed writers. Registration for the Ocean State Writing Conference is open and the schedule of events may be accessed through the Creative Writing homepage.